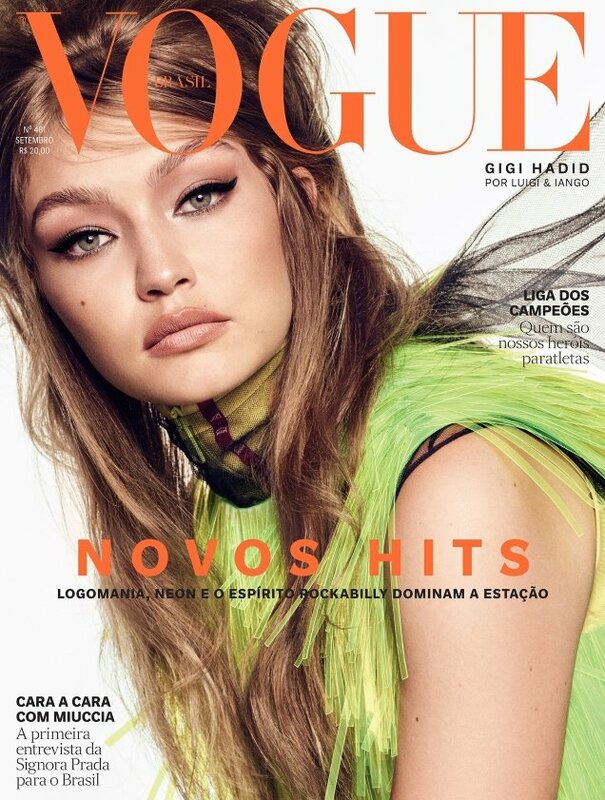 We were wondering when Gigi Hadid might show up on a September cover — and here she is on the new Vogue Brazil issue, three years after her last appearance. The cover was shot by Luigi & Iango, who previously shot Gigi for the likes of Vogue Japan, W Korea and Maybelline. Complete with styling from Pedro Sales, Gigi sports a bouffant 60s hairdo, a winged eyeliner look and neon Prada in the cover image. Members of our forums are growing increasingly tired of the same old setup. “It looks like an outtake from another shoot and they just cropped in her face,” pointed out gossiping at once. “Looks like an outtake from her last Vogue Japan cover story, same hair same makeup… a Luigi & Iango signature,” added badgalcrush. “I feel like there’s a Luigi & Iango pack when you shoot with them. Same makeup and same hair. I feel like I’ve seen it many times because I know for a fact that I’ve seen it too many times, and I’m not going to fall for it this time,” Lola701 ranted. “I don’t like what’s going on in the neck area,” said mikel. “She looks caught off-guard,” noted forum member Elite13. Nymphaea liked it, however. “Tinkerbell about to take off. The colors are nice, the makeup and hair á la Brigitte Bardot. Not bad,” she said. “Damn, Vogue Brazil is on a roll. I think this is stunning and Gigi looks gorgeous. This is once again giving me Vogue Italia x Steven Meisel tease. I’m loving L&I for VB,” guimon wrote. Are you here for it? See Gigi’s accompanying cover story and share your thoughts here.